FSTE is organizing a series of Inspirational Life Talks as part of our new QESS project, whereby invited influential figures will share their personal stories to encourage us, especially young people to stay positive in face of adversities. In the premiere show, we are honored to have Mr Wu Siu Hong, who recently won Hong Kong’s first-ever Men’s Trios gold medal with his partners at the 2017 World Championships. Through Wu’s sharing of his fight with cancer and the demise of his father and partner, we hope to encourage everyone, especially young people to stay positive in face of adversities. 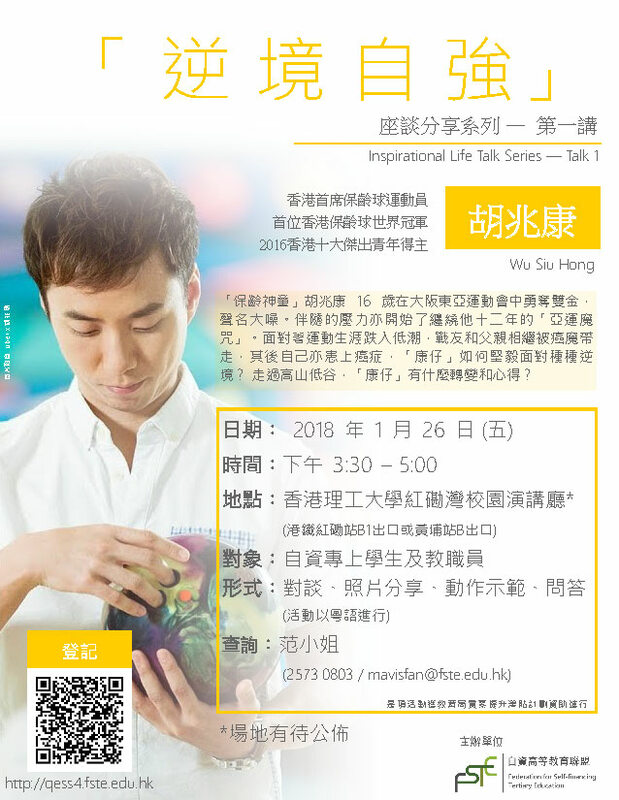 Students and colleagues of FSTE Member Institutions are welcome to join, sign up at Inspirational Life Talk Series – Talk 1: Wu Siu Hong. “Bowling prodigy”, Wu Siu Hong made his name heard at the age of 16 when he won double goal medals in the 2001 Osaka East Asian Games. The pressure arose from competition had cursed Wu to underperform and he waited for 12 years to nail his elusive individual honour in the East Asian Games. In face of plummeting sports career, the demise of his father and partner from cancer, and subsequently his diagnosis with cancer, how did Wu persevere in face of various adversities? Having gone through thick and thin, how has Wu transformed? And what has he learnt?